As a treat for the Ironman 70.3 triathlon participants and followers happening on Sunday, the weekend is going to be all about strength, endurance and speed. And what better way to showcase these than by sharing photos of speed and power through Globe's latest Instagram promo, #GlobePowersIronman! 1. Capture the speed of the triathletes. Those who are attending Ironman 70.3 Philippines at Mactan this Sunday can capture the best photo showing an athlete gunning for faster run, bike, and swim time. 2. Staying at home? Don't fret!Share your own Ironman challenge! Those who will not be at the event can still join by uploading photos that show their own quest towards becoming an Ironman. 3. Just keep sharing. Upload and share as many photos as you can on Instagram. Don't forget to use the hashtag #GlobePowersIronman and tag @enjoyglobe. 4. Start posting today! The contest runs from August 2 to August 6. 5. Those lucky wonderful photos will get the chance to win exciting freebies. 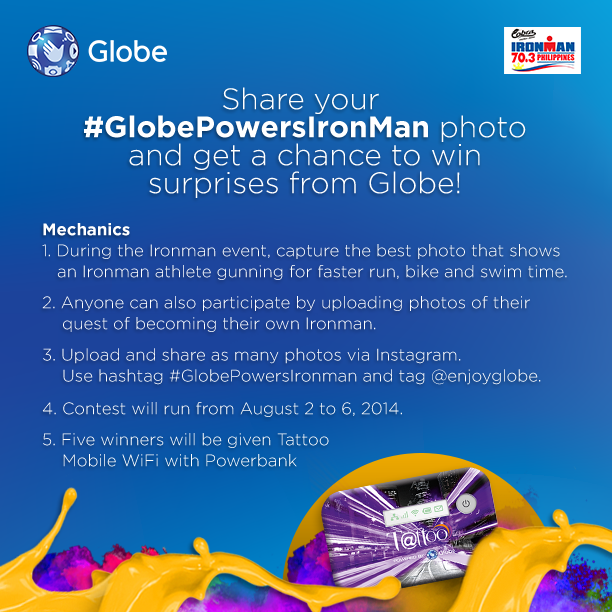 Globe has some surprises in store for those who share their #GlobePowersIronman photo. Five (5) winners will each be given a Tattoo Mobile WiFi and a power bank. Keep those creative Ironman photos coming over the weekend till August 6th!